In 2000, there were few superheroes in movies. Joel Schumacher had kamikazed Batman, Bryan Singer’s X-Men was beta-testing audiences’ threshold for geekier properties, and Spider-Man’s record-breaking opening weekend was still two years away. The possibility that Norse gods, shrinking high-tech suits, and purple aliens coveting galactic jewelry would dominate our theaters would have seemed ludicrous. Now that all that has happened, what’s become unbelievable is that no film could have a greater impact on the modern escapades of the caped and cowled than one currently celebrating its 15th anniversary: M. Night Shyamalan’s Unbreakable. Unbreakable was something of an oddity in 2000. It was an origin story when non-comic readers were unfamiliar with them. It was a serious-minded, reality-based superhero movie when there were none. 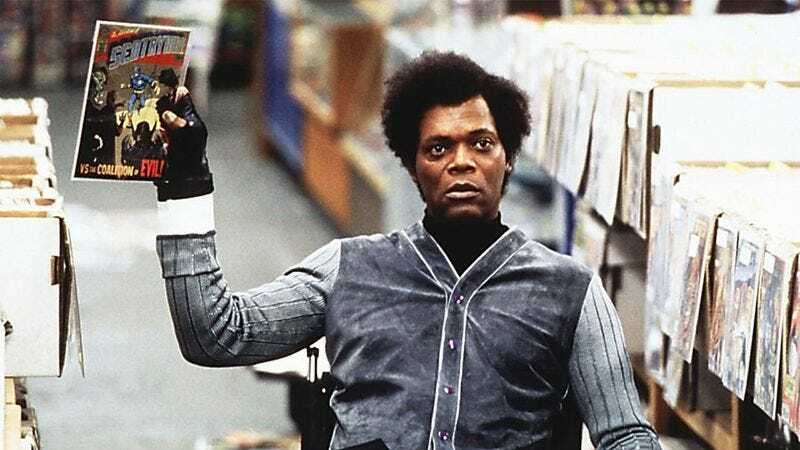 Not only that, but it was an unconventional hero narrative, in which security guard David Dunn (Bruce Willis) is led to believe that he has powers by an osteogenesis-imperfecta-suffering comic devotee, Elijah Price (Samuel L. Jackson). It was a small-scale origin story not about a hero needing to learn how to use new powers, but one that made a mystery—one unsolved until late in the movie—out of whether its hero even had powers at all. What also distinguished Unbreakable was its greater emphasis on the human parts of its superhuman story. The mystery may drive the film, but in spirit it’s closer to a character drama. David doesn’t face supervillains or world-ending threats, but things more recognizable: the deep melancholy he wears like his trusty poncho; his growing estrangement from his wife; his inability to be the father his son needs him to be. Unbreakable blends the mythological with the personal. David doesn’t just slowly discover his abilities, but himself; he seeks heroism not necessarily to provide salvation for others, but so he can have purpose again, so he can feel whole. Yes, Unbreakable is thrilling as a story about a self-professed ordinary man discovering he is extraordinary, but it’s most powerful as a story of a broken man looking to fix himself and his family—to save not the world, but his world. In other words, Unbreakable is about something. It’s never willing to sacrifice universal themes, relatable characters, and mature storytelling for superhero thrills. The same can’t be said about superhero movies in 2015. Now that the adventures of the super powered have become ubiquitous, and films are streamlined into cinematic universes and house styles, we’re increasingly seeing homogenous plots, visuals, and ambitions. We have third acts that devolve into CGI fireworks that are not only strikingly similar, but whose apocalyptic stakes are so detached from reality they feel meaningless. Then there’s the hero characters whose personality only go as far as the fabric of their capes. They may save the universe, but they never feel universal, and character development is often forfeited for character cameos. As for the plots, they feel increasingly like they’re adhering not so much to any kind of creative ambition, but instead to a corporately mandated playbook. With superhero movies becoming increasingly ho-hum as they answer the question “Where do we go next?” with “BIGGER,” one can’t help but despair that the better answer will never be considered: “Smaller.” That’s why Unbreakable, on the occasion of its 15th anniversary, has become not only better and more relevant, but desperately needed—not just as a welcome (retroactive) counter-programming and palate cleanser, but as a possible example of the benefits of going smaller. Awe? Unbreakable achieves it with a workout scene, a magical moment when David and his son decide to test how much weight he can lift. As the scene goes on, and David lifts more and more, we share the wonder of their growing realization of how strong David is, how much stronger he might be, and that he could really be a superhero. What about third act stakes? Unbreakable pulls it off in a single suburban home. There David faces off against a killer holding a family captive, in a climax full of tension because what’s at stake isn’t just the horror of a family dying in their own home, but the risk that David might fail on his first outing as a hero and never realize the destiny he’s chosen for himself. Some of the last moments of Unbreakable drive home how consequence and significance it achieves with very little. In the (non-twist) ending, the morning after David has saved the day, his own family is gathered in the kitchen for breakfast. David puts a newspaper article about the heroic feat in front of his son. His son looks at it and then, tears in his eyes, looks up at his father in search of confirmation that he really is the anonymous hero on the cover, the hero he believes his father was all along. David, with a gentle smile, nods. That moment is everything. More than Unbreakable finally confirming David is extraordinary, and more than Elijah’s devastating revelation yet to come, this is the whole movie. It’s a father finally bonded with his son after reconciling with his wife the night before. It’s a family peacefully reconnecting over a simple breakfast. Most of all, it’s a man who has accepted who he is supposed to be. He has completed the journey the movie has set him on, and you feel like you’ve gone somewhere important with the movie’s characters. You leave having seen something consequential and profound. You leave feeling that Unbreakable mattered. Does this mean for modern superhero movies to matter, Thor: Ragnarok should be a Before Midnight-like drama solely about Thor and Jane Foster’s relationship, or that Doctor Strange should be about a web developer named Stephen Strange who believes he’s going insane until someone tries to convince him his hallucinations are actually magical abilities? Of course not. We still need, and want, superhero movies to be bigger than life. There is meaning in escapist entertainment, but this brand of escapist entertainment needs to work harder at being meaningful. Modern superhero movies could look many places to learn how to take a step back from their playbooks or perpetual phase/team-up planning. But it’s hard to imagine a better source of inspiration than Unbreakable. A few pinches of the thematic and character driven success of M. Night Shyamalan’s movie could go a long way toward making superheroes and their fights mean something again. What’s at stake is nothing less than the future (quality) of superhero movies.